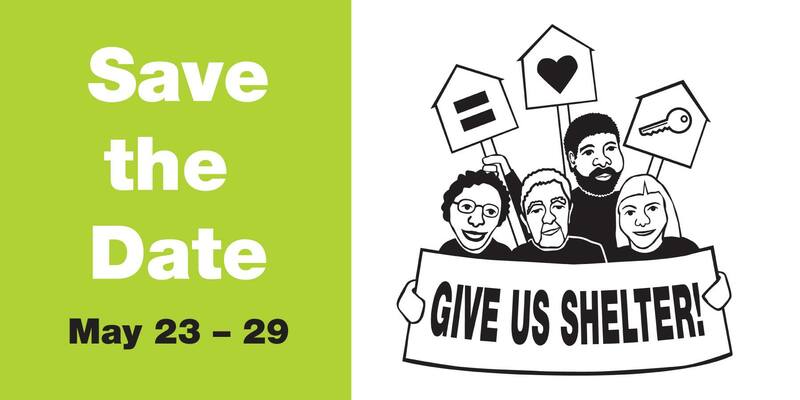 The Solidarity Calendar is a monthly notification of actions and events organized by Portland JwJ or are endorsed and sponsored by our Steering Committee. Steering Committee meetings are held on the first Monday of each month at 5:30pm in our office conference room at 1500 NE Irving Street, Suite 585 Portland, Oregon 97232. The Solidarity Calendar is available on the first Wednesday of each month. If you would like to receive a Solidarity Calendar via email join our mailing list! The Executive Committee acts as the Executive Board for the 501c3 Portland Jobs with Justice Education Fund. At our monthly Steering Committee meeting on April 1, 2019 nominations for all board seats opened for our 2019 Executive Committee elections. Nominations will remain open until our next Steering Committee on May 6, 2019 at 5:30pm. If there are no contested seats, then all nominees will be elected by acclamation of the Steering Committee at the May meeting. If there are contested seats, the contested seats will move to an election that will take place at our June Steering Committee meeting on June 3, 2019. For more information, or if you would like to nominate yourself or someone else for the Portland Jobs with Justice Executive Committee, please email our Executive Director, Will Layng, at will@jwjpdx.org. Click Here for more information on the different Executive Committee seats. Join Reed CSOs to Deliver Petition Demanding Union Recognition! Campus Safety Officers at Reed College have formed a union and are demanding recognition from the university. Many of the issues that led the unionization effort in the first place have gotten worse. In one recent incident, Community Safety was so under-staffed during Theme Reveal that officers felt they had no option but to triage medical calls. This is a very worrying development for student safety, and management’s continued inaction on the matter of staffing, as well as numerous other issues which have negatively impacted the department’s morale and effectiveness, speaks volumes about their commitment to their mission. Rally to demand union recognition for Reed CSOs! Thursday April 4, 2pm on the lawn in front of Eliot. At 3pm, CSOs, community supporters and alumni will deliver a community petition to Acting President Hugh Porter. Click Here to RSVP for this action. Stop the Exploitation of College Instructors! Clark College Association of Higher Education in Vancouver, WA has attempted to bargain faculty salaries and other important issues for four months and has been largely ignored by administration that is unwilling to seriously negotiate with the union. Part-time instructors at Clark College are exploited and work as subcontractors, earning about half of what full-time faculty earn. Workers are pursuing salary increases to alleviate this exploitation of part-time workers as well as salary increases for all faculty. Clark College faculty are taking action by sitting out of a required workday. They will be taking personal days and rallying outside the college instead. 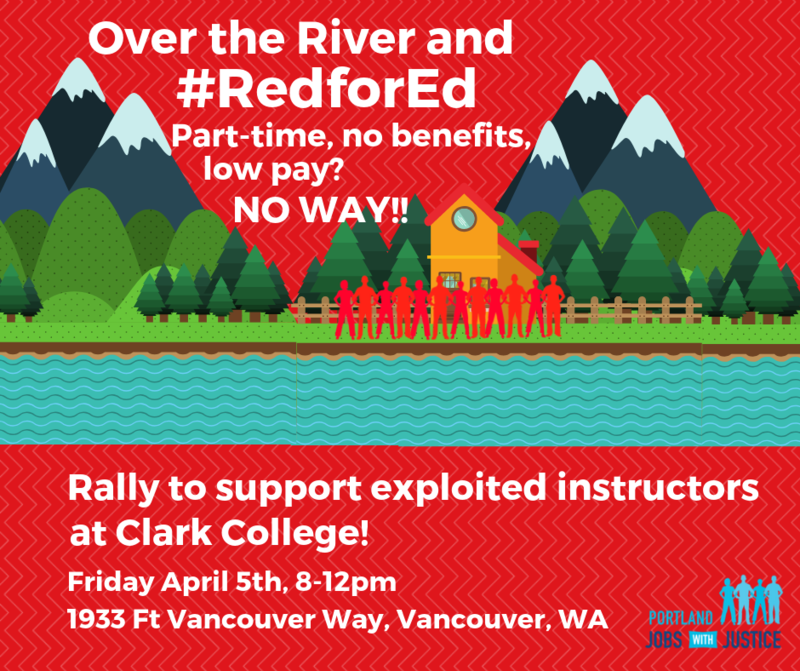 Join us and rally with them to let Clark College know the community won’t tolerate exploitation! 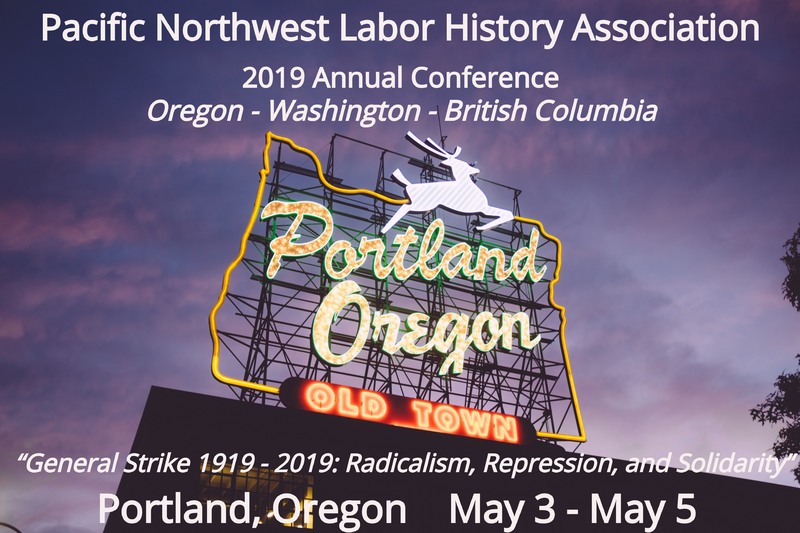 2019 Portland Labor Notes School! It’s bigger than one workplace. From teachers to truck drivers and dockworkers to dietitians, greedy corporations are pushing a coordinated agenda to slash wages, abolish pensions, outsource jobs, and gut public services. We need unity to fight back and win. Activists from across the Pacific Northwest are planning a day of skill-building workshops, education, and strategy discussions to put some movement back in the labor movement! 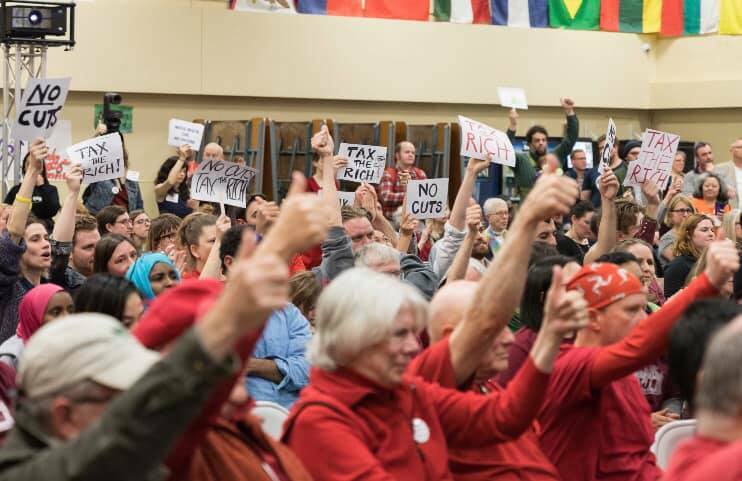 The 2019 Portland Labor Notes School will draw on the experience of local labor and community campaigns and successful struggles around the country. It will be a great opportunity for union members, stewards, and activists to share strategies and build the solidarity required in these tough times. Click Here for more info on registration and to share this event on social media. No More Austerity Budgets in Portland! Tax the Rich! It’s that time of year again when the mayor demands tons of budget cuts on the backs of working people and vital social services, despite a supposedly strong economy. This time dozens of parks jobs, classes, camps, a community pool, and a whole community center are on the chopping blocking. But Portland DSA, JwJ, Laborers Local 483, and others are fighting back and demanding no more cuts and no more austerity budgets. We are tired of never-ending cuts and the FARCE that we don’t have enough. We need leadership that EXPANDS our parks, implements UNIVERSAL PRE-K and instead of cutting necessary community service jobs, HIRES MORE CITY WORKERS to support our communities. Come out for a community work session on the budget for the Department of Parks & Recreation, hosted by the Tax the Rich Portland campaign. Tuesday April 9 at 6:30pm at David Douglas High School (1001 SE 135th Ave). Oregon’s legislative leaders have proposed massive cuts to education spending that they say will result in the loss of either multiple schools days or hundreds of teacher jobs. It’s time to end the constant austerity budgets and start providing good funding our state’s schools. 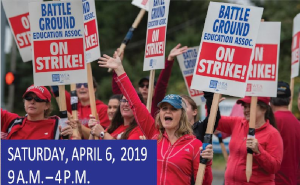 Join educators, JwJ, and other community members for the largest rally for education in Portland! Wednesday April 10 from 3:45-6pm at Pioneer Square (701 SW 6th Ave). 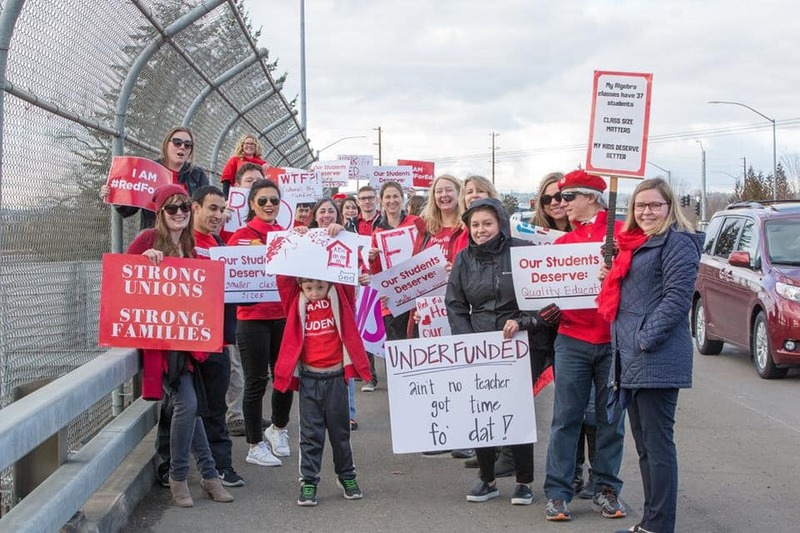 We will meet at Pioneer Square and take to the Max trains dressed in #RedForEd to share the message that our schools are in crisis and need funding! Then we will have a rally in Pioneer Square at 4:45pm. Join us! Save the Date: Tax Fraud Days of Action! A minimum of one in five construction industry contractors commit intentional tax fraud. These are huge for-profit corporations that are getting away with not paying taxing by paying workers under the table or by purposefully and incorrectly classifying workers as independent contractors to avoid payroll taxes and other obligations. Construction contractor tax fraud robs our us out of billions in tax revenues that could be used to better fund vital social services. No job site is immune. No state is immune. Join us for a day of action against tax fraud in the construction industry! Rally on April 15, 12pm, at Director’s Park (815 SW Park Ave.) with flyering later in the evening at three different post office locations. Haga clic aquí para mas información en Esponol. US Mail Is Not For Sale! Attempts to privatize the US Postal Service continue, and Trump recently proposed cutting the wages and benefits of postal workers. But the community is continuing to the long-term struggle to save the People’s Postal Service! from 12-1pm at the Waterfront Post Office, (101 SW Madison). This is part of a national day of action, called by the postal unions, to draw attention to the fact that the US Postal Service takes NO TAX DOLLARS but is threatened with being sold off to private corporations after being downsized and overpriced. Save our jobs, save our service! Click Here​ to register for the conference. We are in a crisis situation! Wages remain low while housing becomes more and more expensive, throwing many low income people and families deeper into poverty. This causes many people to be homeless or be on the verge of homelessness. Affordable housing is in short supply creating additional stress, over burdening the community as a whole and creating friction between the housed and un-housed. This is not just a urban crisis. Join us for a community event to send off the crew that is marching to Salem! Thursday May 23 from 5-9pm at Glenwood Park (SE 87th & Glenwood). Click Here for more information and to register to join the march to Salem! Join us for JwJ’s 3rd Annual Summer Solidarity Celebration! 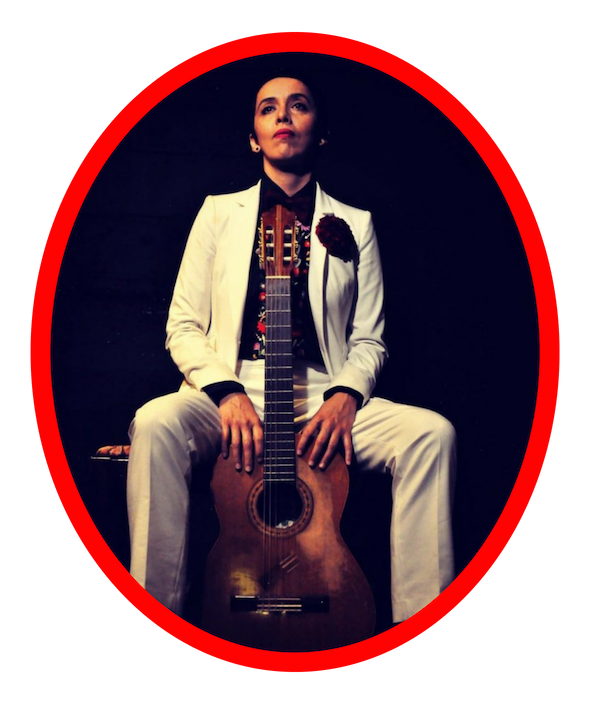 We are thrilled and excited to invite members of our community to JwJ’s 3rd annual Summer Solidarity Celebration featuring Edna Vazquez! Thursday May 30, 2019. 21+ only. Doors 6pm. Music begins at 7:30pm. The space is ADA accessible. If you need ASL interpretation please email justin@jwjpdx.org no later than May 16th so we have time to make the proper arrangements. Spanish interpretation of our brief program will be provided. There are a limited number of scholarship tickets available. If you would like to attend but can’t buy a ticket, please contact justin@jwjpdx.org for more information. Click Here for more info and to get your tickets today! Estamos entusiasmados de invitarles a nuestra tercera celebración anual de solidaridad del verano, con la grata participación de Edna Vazquez! Lagunitas Community Room (237 NE Broadway St # 300). La música comienza a las 7pm. El espacio es accesible para ADA. Si necesita interpretación de ASL, envíe un correo electrónico a justin@jwjpdx.org a más tardar el 16 de mayo para que tengamos tiempo de hacer los arreglos adecuados. Habrá interpretación en español de nuestro breve programa. Hay un número limitado de boletos de becas disponibles. Si desea asistir pero no puede comprar un boleto, comuníquese con justin@jwjpdx.org para obtener más información. Save the Date: LGBTQueer Union Summit! The LGBTQueer Union Summit will convene LGBTQ workers, activists, and allies in unions throughout the state to share power and build relationships, focusing on leadership by unionists of color. Build and advance leadership, mentorship, and knowledge of LGBTQ Union members, leaders and staff. June 21, 2019 at 8:30am. Hosted by Diamond Law Training and the University of Oregon’s Labor Education Research Center. Check back for more information on location and registration. Our Portland Rising Committee will not meet in April. The next meeting will be on Wednesday May 8th from 6:30-8pm. Check back in next week’s email for location information. The JwJ Healthcare Committee works to promote healthcare as a human right at the local, state, and national level, to defend union health plans, and to fight for fair, equitable and comprehensive health care that covers everyone and is paid for with public funds. The next committee will take place on Tuesday April 16 from 5:30-7pm. at 5804 SE 77th Ave. Portland, OR 97206. Our Faith Labor Committee‘s next meeting is Wednesday April 24, 12-2pm at the JwJ office. 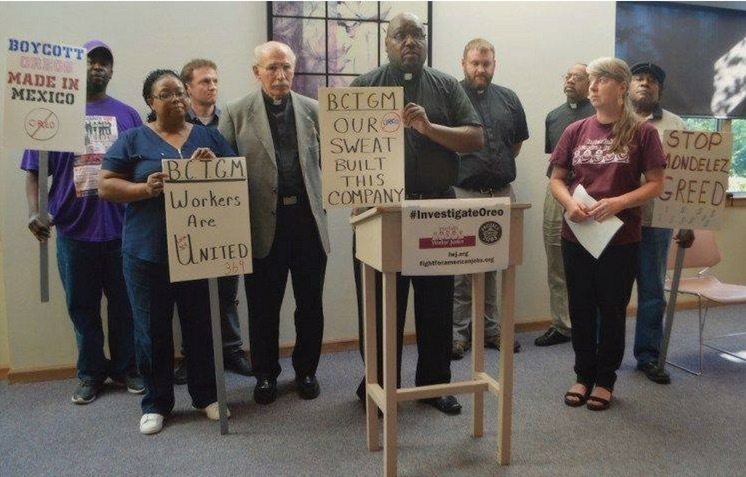 The Faith Labor Committee is made up of labor and faith activists and leaders who come together to build sustained relationships between the labor community, and individuals and congregations in the faith community. Based on these relationships, the committee works to develop and implement outreach strategies to facilitate the faith community showing up in support of the struggles of working people in our city. Portland Jobs with Justice has long history of global justice and international solidarity work ranging from organizing caravans to the 1999 WTO summit in Seattle and supporting striking GM in workers in Columbia, to mobilizing war resistance and exposing the lies of companies like Nike about their treatment of workers. Oregon Fair Trade Campaign office (2701 SE 14th Ave Suite E). Do you value the Portland Jobs with Justice Solidarity Calendar as a community resource that helps keep you engaged and connected to the local movement? Consider making a donation or becoming one of our sustaining members with a monthly contribution of $5 or more. Click Here to make your contribution today!